This work by Nick McCann greets visitors as they enter the Rolls Building. Based on the Rhinebeck Panorama of early 19th century London it incorporates current day features of the cityscape, some of which are direct references to cases settled in the jurisdictions now located at the Rolls Building. Neil Roland has produced a series of photographic images informed by the work of the Rolls jurisdictions and the building’s setting in the heart of London. 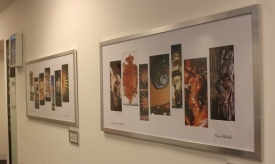 His pictures are displayed on the 1st, 2nd and 5th floors of the building. 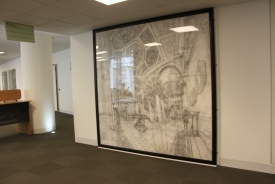 This large scale, ink on paper drawing of London Bridge is by Christopher Green, one of a number of artists exhibited at the Rolls Building who is associated with the Prince’s Drawing School. It is displayed on the Ground Floor by the public lifts that take litigants, lawyers, witnesses and other parties up to the courtrooms. 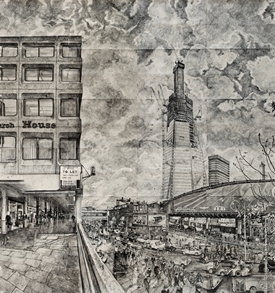 Both this drawing, and the London Panorama, show the Shard, the tallest building in the European Union, under construction. 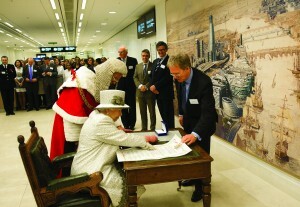 The four large drawings displayed on the 2nd floor are the result of a commission from the Prince’s Drawing School in 2011 for a special event at Buckingham Palace to mark the tenth anniversary of the school which was set up by The Prince of Wales. The occasion was themed around famous balls of the twentieth century. Phoebe Cope, Christopher Green and Rydal Hanbury were invited to make eight-foot square drawings of ballrooms in St Petersburg, New York, Paris and Venice where some of the grandest most elaborate parties of the century took place. The drawings formed the backdrop to four stages set up in the Buckingham Palace Ballroom where costumed dancers from English National Opera performed dances evocative of the age. Phoebe Cope’s drawing (pencil on paper) shows The Winter Palace in St Petersburg where in 1903 a ball was given for the entire Russian Imperial Family. The Château de Ferrières, just east of Paris, drawn (ink on paper) by Christopher Green was the venue for the Rothschild’s ‘Proust Ball’ of 1971. Christopher’s second drawing (ink on paper) shows the Grand Ballroom in New York’s Plaza Hotel where in 1970 Truman Capote hosted the Black and White Ball. Rydal Hanbury has drawn (charcoal on paper) the Palazzo Labia ballroom in Venice including eighteenth century costumed characters from the ‘Le Bal Oriental’ of 1951. 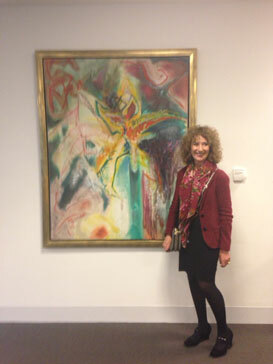 After the event at Buckingham Palace, in March 2012 the drawings were given a public exhibition at ’6 Foot and Over’ at the Prince’s Drawing School in Shoreditch. From here they moved to the Rolls Building on a long-term loan. 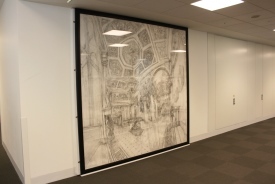 An illuminated scroll, prepared on vellum by Tim Noad, is displayed in the ground floor atrium area. 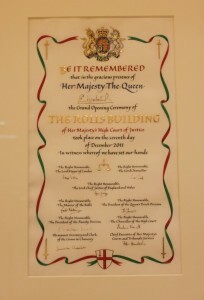 It commemorates the official opening of the Rolls Building by Her Majesty the Queen on 7 December 2011. 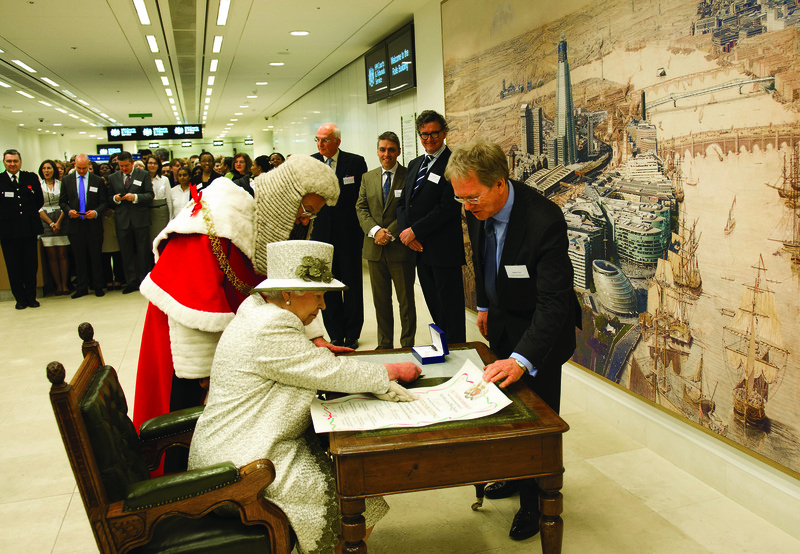 It is signed by the Queen, the Lord Mayor of London, the Lord Chief Justice and other senior members of the Judiciary and Courts administration. Commissioned as a steam yacht for Emperor Alexander ll of Russia the Livadia was designed with a hull “following the form of a turbot”. Sadly the saucer shaped vessel did not achieve its intended stability and on its maiden voyage in 1880 passengers reported it being tossed around like a cork, out of control and awash with water. Following the assassination of Tsar Alexander it was stripped of its fittings and used as a coal barge in the Black Sea where it was eventually abandoned and broken up for scrap in 1927. 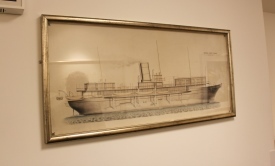 Copies of the original design drawings for the ship (kindly donated to the Rolls Building Art & Education Trust by Bruce Harris FCIArb) are on display close to the Admiralty Court on the 1st floor. The Silver Admiralty Oar has been the visible sign of the authority of the Admiralty Court since the reign of Henry Vll (1485 – 1509). It is traditionally displayed in court when the Admiralty Court is sitting. The present Oar was probably made at the time of the Restoration with later additions – eg the hall marks on the shaft indicate that this part of the Oar was made in 1798, the year in which Lord Stowell became Judge of the High Court of Admiralty. The Oar is on display on the 2nd floor outside the Admiralty Court. Thomas Edward Scrutton (1856 – 1934) was a key figure in the development of the Commercial Court jurisdiction. Before his appointment as a judge of the King’s Bench Division in 1916 he had enjoyed a very successful academic and professional career. His work on ‘The Contract of Affreightment as Expressed in Charter-parties and Bills of Lading’ was first published in 1886 and continues in the publication of the 125th Anniversary edition. His granddaughter, Dr Mary Midgley, has kindly donated the Letters Patent and Seals relating to his appointments as King’s Counsel (1901) and High Court Judge (1910) for permanent display at the Rolls Building. 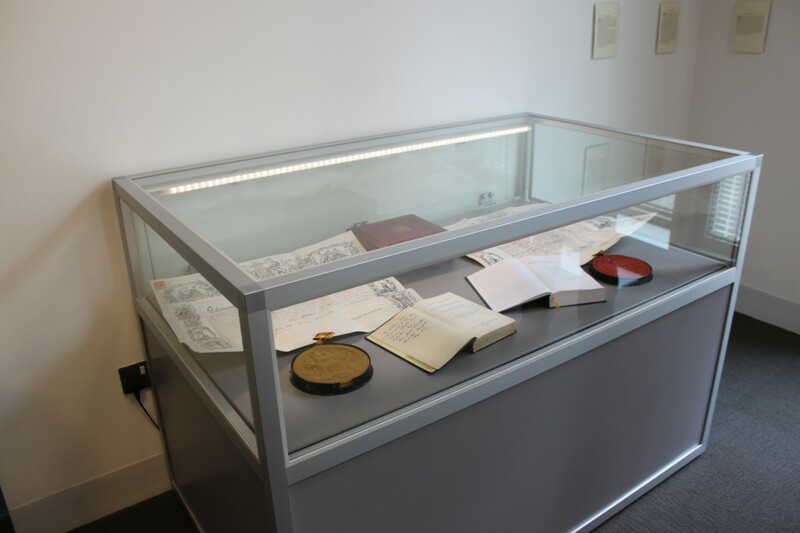 Included in the display, which is on the 2nd floor, are a first edition of Scrutton on Charterparties signed by his daughter, Janet and a copy of the 125th Anniversary edition signed by his great grandsons, Tom and Martin Midgley. Nick Chambers QC has presented the Trust with a set of his entertaining and informative prints on Missed Moments in Legal History which depict fanciful scenes of what might have happened instead of what did happen to people who met the law. It was inspired by the tale of Mrs Donoghue who found a decomposed snail in a bottle of ginger beer and made legal history. As well pursuing a successful career at the Bar and then being appointed to the judiciary, Nick Chambers is an accomplished watercolorist. 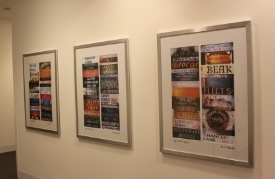 The prints are displayed on the 2nd floor.